In 2002 Sonny’s 20-year high-tech career as a software engineer and Internet web developer came to an abrupt halt. The Weare, NH resident saw his department downsized and then, outsourced overseas. In the months following, his wife Lynne faced a battle with breast cancer and left her position to accommodate her treatment schedule. In the midst of these life-altering setbacks, the Brides set out to be proactive about what their future would hold. Pooling their education, talent, business background, and experience, the couple began to build a company that encompassed what they knew, web-site development and furniture making. 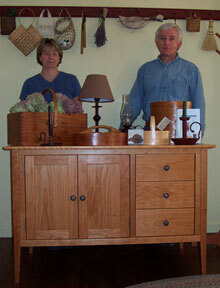 Together they established Meadowbrook Creations, the parent company of NHwoodworking.com, their ‘make to order’ furniture business specializing in Early American and Shaker inspired pieces, all designed by Sonny and Lynne. The ability to combine their web-site development skills with their love of woodworking has allowed the Brides to build a business that has delivered their handcrafted furniture into homes in every state of the continental US. Their business has seen growth that the couple couldn’t predict, doubling each year since 2002. NHwoodworking.com’s specialty bathroom pieces, which include vanities, medicine cabinets and mirrors, is growing at a blockbuster rate. They attribute much of the growth to the free design service they offer their customers.